Today’s project uses Lori Whitlock’s Die. Click here to order the die from Michaels. 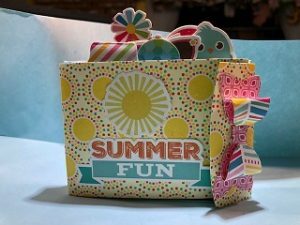 There are two paper collections also used, summertime and I love sunshine also from Lori Whitlock, manufactured by Eco park. For embellishments, I took advantage of the stickers from the paper pad. I also cut out a bow for the front closure. This die is from Pink and Main. I like this die so much, I’ve purchased 5 of them, so I can die cut as many bows as I may need for projects. 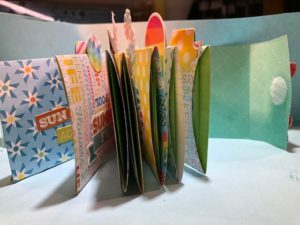 The fun tabs on the pages were made using punches from my personal collection. The closure uses a small circle Velcro self adhesive circle. It was the perfect size for this project. In my project since I am using photos from my recent trip to Hawaii, I decided to keep the pallet fun and bright. As usual, if you have any questions, feel free to email me at Ms.Rhetta@gmail.com please put the name of the project as your subject so I know the email is not spam. I will appreciate that very much. These small pockets will hold an insert that is approximately 3 3/4″ X 2 7/8″. to print off these small pictures, I used my Polaroid Zink Printer. Amazon has a really great value on this printer, which includes the zink paper. Click here to buy yours. One of the neatest things about t The Zink paper is the ability for an instant photo that is actually adhesive backed. This has many advantages, one of which includes the ability to use these small photos as a sticker, which is exactly what I accomplished with this project. You can also print lists, small photos, date reminders (the list is only limited to your imagination and technology). 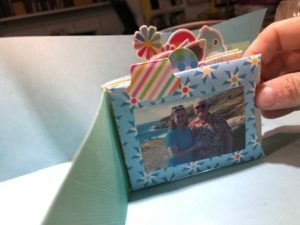 Making this an idea item to have in things such as personal day planners, or printing off pictures for pen pals, family and friends. I highly recommend it. I’ve had my printer about 4-5 years now and really am still enjoying it. It is not very large so it fits easily into your purse. My husband and I did enjoy our trip to Hawaii. We visit the island of Oahu. This trip was a celebration of our 18th Anniversary. During our adventures another couple from our church joined us for a day and a half of sight seeing. It couldn’t have been a better trip, except for one tiny exception. Oh I shouldn’t say tiny, I dropped my cellphone in the causeway at the Hawaii airport. One of their workers found it, called (my husband’s cell) and returned it safely to me. To say the least, I’m working on thank you card for him that will include a Visa gift card. There aren’t enough people like Mr. Frank in the world. I am so grateful I didn’t need to replace my phone and this gentlemen was kind enough to return it to me.